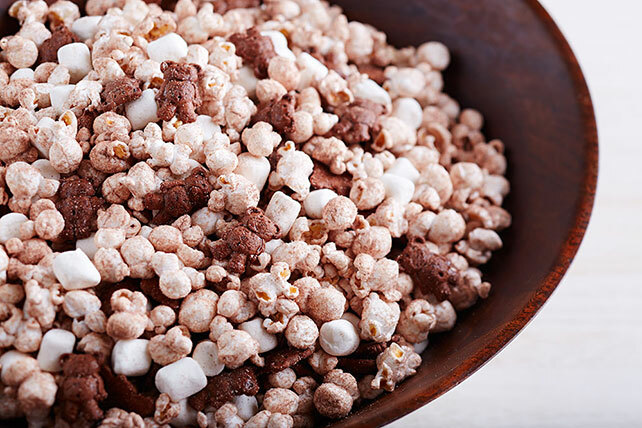 This blend of popcorn, marshmallows and bear-shape chocolate graham snacks sprinkled keeps the party going (and the recipe requests coming). Toss popcorn, marshmallows and graham snacks in large bowl. Sprinkle hot cocoa mix over popcorn mixture; toss to coat. Serve immediately or store in airtight container at room temperature for up to 1 week. Pop up 1 (3.35-oz.) bag microwave popcorn to use in this recipe.